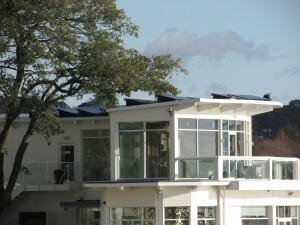 The latest in GPS Commercial Solar Panel installations is The Kitchen located in their hometown of Poole on Poole Park. This two storey, glass fronted restaurant provides amazing views of the park’s saltwater lake which is enjoyed by customer’s whatever the season. 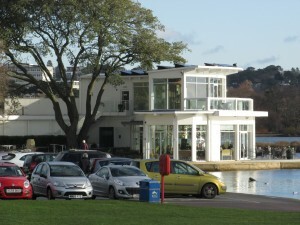 The lake, and the park itself has been a part of Poole’s history for several decades and visitors can now enjoy anything from a sandwich to a stone baked pizza over a glass of wine or beer while taking in the views. Now owned by local couple, Richard and Sarah de Lisle, considerable investment has been made to every aspect of the building for the benefit of the town and the park. The latest of which is a 40 panel solar energy system, featuring SolarWorld panels and GPS preferred Enphase Micro-Inverters for the added energy generation. This investment has future-proofed the venue by reducing its energy running costs and securing a feed-in-tariff income over 20 years. To maximise energy generation, each panel has been fitted to an angled, weighted pod which at first site appears to resemble waves to reflect its watery location.